Ralph Hobbs is a giant of a man, looking more like a gym instructor than an art dealer. His Sydney CBD business - Nanda/Hobbs - is as imaginative in its ways of dealing art as the surrounding bankers (who are often his clients) have to be. His website distinguishes between Represented Artists and Indigenous Artists, for the nine artists listed in the latter category are all senior figures who have chosen to paint their Desert or Gulf stories in circumstances where they are most comfortable and best supported, rather than in communities where they may be constantly 'humbugged' by family and friends. This puts them and Nanda/Hobbs outside the remit of organisations like Desart and the Indigenous Art Code - which Hobbs sees no point in joining as a dealer who may get little joy from its emphasis on the purity of the community art centre system. But this hasn't stopped Hobbs from visiting his Aboriginal artists as they paint, researching and writing about them in books such as The Art of Nyurapayia Nampitjinpa (Mrs Bennett) and obtaining serious canvases to sell. As he prepares to take two of his Represented Artists to Venice during the Biennale, his thoughts on matters closer to home make interesting reading. The rise and fall of the Indigenous art market over the last few decades is a fascinating case study in perception over fact, market forces over cultural importance and short-term greed over long-term sustainability. It demonstrates what can happen when quality is not a primary consideration in the sale of art—when one ‘buys’ rather than ‘collects’. It is also interesting to consider how the mainstream press has, in recent years, avoided the great and progressive things that are happening in the Indigenous art world. The real story is how Indigenous art, as an overriding movement, has continued to build and develop with new artists and new relevant, important ideas. Furthermore, it has constructed a diverse visual language that speaks of the country and its long, often neglected pre- and post-colonial history. It is indeed good news for Australia that the broader Indigenous art movement is alive and well. Whilst many in the tourist/decorative and trinket trade may disagree, the higher echelons of Indigenous art remain culturally significant and, it could be argued, are even more socially important now than ever before. It is impossible for a progressive society such as ours to be taken seriously on the world stage in this age, without a strong understanding of our Indigenous history. The political will and the pervading social climate is far more receptive to Indigenous rights and culture than ever before. The re-reading of our complex history coupled with an acceptance of differing views of our landscape, demonstrates a maturing of the aesthetic understanding—from the traditional and iconic nationalist vision of Heidelberg artists of the 1880’s to the aerial totemic paintings of the Western Desert artist in the 1980s; and on into the post-colonial contemporary artists of today. The embrace of these ‘outsider’ views in our conversation about this country—on the part of Australian institutional collections and private collectors—has been an enduring and positive marker of the past decade. The art market is of course just that—a market. One cannot divorce the transactional nature of selling artworks from the discussion about how successful a movement is, no matter how culturally significant it may be. And the most trackable sector of the art market is the secondary auction market. The online website, Australian Art Sales Digest, provides interesting reading for those who like to analyse the figures behind the sales hyperbole. Looking specifically at Indigenous artworks, the auction market in 1990 saw just $169,000 in total sales. In 2007 at the height of the art boom, the combined total of auction results for Indigenous art was a monumental $26,455,000. Post GFC, the annual totals dropped significantly from this high – but so did the rest of the Australian art auction market. The 2015 ($12,795,000) and 2016 ($8,593,000) totals still represented solid turnover and interest in these special works. To put recent results in perspective, last year’s secondary sales are only just behind the auction results of 2003—a time when the Indigenous art market was in full swing. These sales figures do not take into account any of the primary sales through galleries or online art sales. 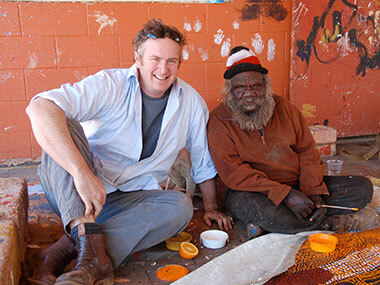 The fact is, the Australian Indigenous art sector is still worth many millions of dollars to the overall art market. The historical sales results indicate that the auction houses play a significant role in building both the market and individual artist’s profiles. One way auctions sought to differentiate similar works was to review provenance, with most only accepting works created through community art centres. On the surface, this approach is a reasonable and ‘ethical’ way to determine authenticity in a grey market awash with unscrupulous dealers, broadly termed ‘carpet baggers’. A bigger issue, however, concerned the increasing value of individual artist’s works—the better-known names began to want a greater slice of the money from the community art centres. They also wanted autonomy to travel and work, where and with whom they pleased. Essentially it was moving to a free market system. Given that Australian Indigenous artists are citizens and should have the same rights as any other citizen, this was a not-unreasonable request. Unfortunately, the systematic and institutional marginalisation of these freelance artists—effectively cutting some of the best out from prizes and competitions and not allowing them to be collected in state and national galleries—has had a confusing and detrimental effect on the confidence of the broader art collecting market. This practice should have raised uncomfortable legal issues, including restraint of trade and the development of an Indigenous art cartel within the art trade. The most important consideration from a cultural point of view is that these artists be freely allowed to create great work worthy of their iconic status, that the largest numbers of people be able to see their work, and that they are paid fairly and well looked after. Hopefully, the debate and relevance of communities versus private dealers and the resulting destabilisation of the market seems to be drawing to a close. Many of the auction houses have dropped their community provenance condition, as well as their stand-alone Indigenous art auctions. Instead, they are opting to include such items in their mainstream Australian art auction catalogues. I view this as a positive step. In many respects, it ends the ethnographic/artefact debate—dare I say cultural divide—in the secondary market. Now all works are beginning to be viewed as “Australian art”. So, what now for the Indigenous art market—now that many of the old people, the first contact greats have passed or are no longer working? 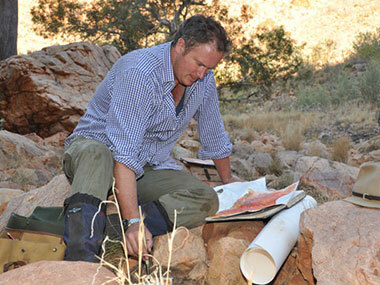 There are some outstanding works being created both in the bush and in our towns and cities. For those in the remote communities, it is about painting as a tribal right and keeping the Dreaming alive and, of course, an effective means to earn a living. There are plenty of remote artists who have developed their own unique style in the context of their personal stories and Dreaming law. In the cities, urban artists who identify as 'Aboriginal' have delved into their personal history and shone a political light on the way we have viewed ourselves since European settlement 230 years ago. For me, these artists are powerful and important contemporary artists. They draw, as all good artists should, on a wealth of imagery and their Western technical training. The work of these artists is less tribal/ritualistic in methodology than that of first contact artists. Rather its value is the light that it shines on important contemporary social issues. It should be viewed in a relevant Western aesthetic context rather than as traditional work. The Indigenous art world is geographically varied and rich in imagery and law. The lessons of recent decades of commercial dealing (the highs and the lows) demonstrate to us that we must apply a similar rigour to the value and importance of Aboriginal artists' work, as we would to the non-Indigenous art world. Blanket assumptions that all Indigenous artists are important, all artworks are great investments or indeed are great works of art without any objective measure, simply don't wash in the cold light of day. The reality however is, if the artist is talented, well-managed and has broad curatorial and market acceptance, he or she deserves to be centre stage in the visual conversation about Australia. There is no denying that the Indigenous art movement is of profound importance to the cultural history of this country, and whether the art market rises or falls in this sector, one cannot change that historical fact.